Available in four sizes from ½" to 1½" for flow rates up to 350 l/min. If your facility already has steam available, you could cut your costs of producing hot water at a stroke. It's an open secret enjoyed by thousands of satisfied Dynafluid users throughout the world. Forget the complexity of installing pumps and water heaters for your washdown or process requirements. Forget the time, nuisance and cost of keeping them maintained. And cut your running costs by up to 80% at the same time! 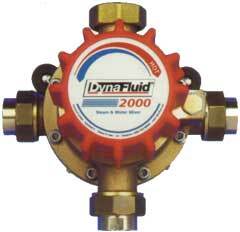 Dynafluid 2000 is the state-of-the-art steam and water mixer valve. It's safe, practical, versatile and low-maintenance too. When the outlet control is opened, cold water flows into the valve body. This change in differential pressure, raises the valve's piston, lifting the steam valve from its seat. Steam combines with the cold water in a mixing chamber to create instantaneous hot water. Once the control is turned off, a spring, reinforced with static water pressure closes the valve. This shuts the steam off completely. So, in the absence of cold water, steam cannot escape through the outlet. This fail-safe principle is the heart of the Dynafluid design and is the key to its worldwide success. Dynafluid 2000 steam and water valves are the preferred choice for a vast array of industries throughout the world. You'll find them in abattoirs, breweries, chemical and pharmaceutical complexes, dairies, food production and processing plants, launderettes - the list is endless! Whether your requirement is hot water for washdown systems, jacketed vessels, back-flushing filters, vehicle washing or in process heating, you'll find a total Dynafluid solution to fit your needs.